Virtual reality is finally available for consumers. Oculus will ship the much-anticipated Rift VR headset next week, HTC will deliver its Vive VR headset one week later, and Sony is also readying the launch of its PlayStation VR headset. Although there are technical kinks to be worked out and business models to emerge, early signs that consumers want VR are positive. The Rift is back-ordered to July, the Vive to May, and, on Amazon, the PlayStation VR Launch Bundle pre-order sold out within minutes of going live. Variety reports that Oculus has shipped more than 175,000 of its pre-release headsets, “since debuting its first version on Kickstarter in 2012.” Buying a VR headset is a significant investment, however. The Oculus Rift costs $600 and the HTC Vive costs $800 — and that’s without the computers with enough processing power for VR (another $1,000 or more). Although the Vive includes the controllers, the Rift does not and Oculus hasn’t yet set a price. Road to VR adds more information, just revealed at GDC, about the PlayStation VR headset for PS4, which will be priced at $399 for the headset, called the Core bundle, and will ship in October. 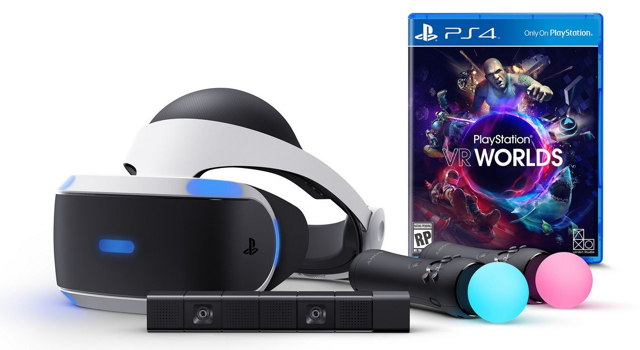 For users who want the headset, two Move controllers, the PS Camera, and “PlayStation VR Worlds” game, the bundle is priced at $499. Although Amazon and Walmart have sold out, the bundles are still available at Best Buy, Target, and GameStop. VR business models could be subscriptions, paid content and/or advertising. Although estimates of what the VR market is worth vary, everyone is talking big numbers. Deloitte Global says revenue from hardware and software will reach $1 billion by end of 2016, a number that CCS Insight agrees with, adding that 24 million VR devices will ship by 2018; Digi-Capital believes that VR and AR will generate $150 billion by 2020.